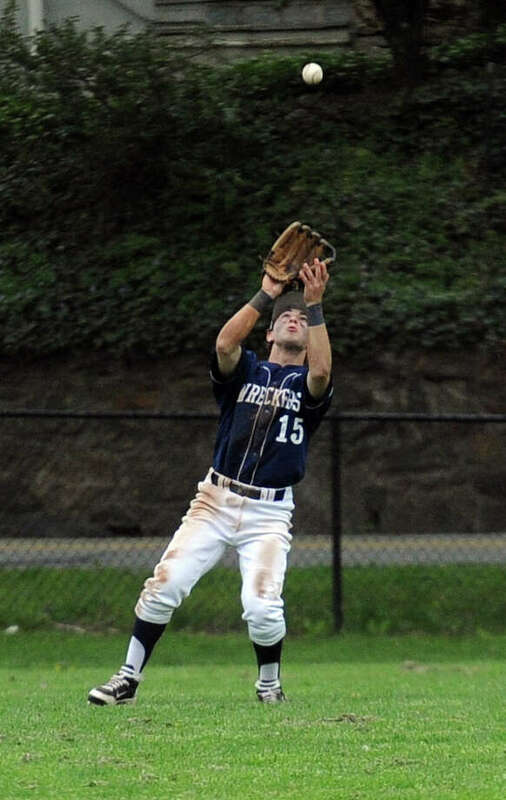 Staples' Ben Lipper makes a catch during Wednesday's game against Staples at City Hall Field in Norwalk on April 27, 2011. Losing never feels good even though perfection is rarely attainable and losses can be educational. The Staples baseball team suffered its first loss of the year and dropped to 9-1, 8-1 in the FCIAC in an 8-4 setback at Norwalk (4-5, 4-4) Wednesday. Despite falling short, this loss could be a blessing in disguise because almost every team suffers a loss and last year, it was 18-2 in the regular season before losing in the first round of the FCIAC and Class LL playoffs. "We try to win every game," Wreckers Coach Jack McFarland said. "With that said, it's tough to win every game. We're happy to be 9-1 at the midway point and I look forward to the second half of the season. If we can go 9-1 on the back nine, I'd be happy." The Wreckers took a 1-0 lead in the top of the third inning. Jacoby hit senior quad-captain Brendan Bernstein with a pitch with two outs and senior Colin McCarthy drove in Bernstein with an RBI double. Norwalk came back with three in the bottom of the inning to take a 3-1 lead. Staples tied it in the top of the fourth by taking advantage of two walks and delivering a timely hit. Sophomore Brian Terzian walked with one out, senior quad-captain Ryan Burke followed with a single and senior Mike McGowan walked to load the bases. Junior Jimmy Kopack then delivered a two-run single to tie it, 3-3. The rightie Kopack had trouble containing the Bears on the mound. He gave up six earned runs on seven hits in five innings with a hit batsman, four walks and three strikeouts and couldn't maintain the tie in the bottom of the inning. But Norwalk got it back in the bottom of the fourth with senior co-captain Spencer Jacoby smacking a 3-run homer to make it 6-3. McGowan singled with one out in the top of the sixth and senior rightie John Lautenbach relieved the rightie Jacoby and hit Kopack with a pitch. Senior righty Jimmy Cooksey relieved Lautenbach and after allowing Wrecker senior quad-captain Ben Lipper's single, he settled down and got five straight outs for the save, the last two by strikeouts. "He's a good pitcher and I'm going to face him next year [in college]," Lipper said. "I saw his first pitch, knew he'd come in with a fastball and I went with the first pitch." Cooksey allowed senior Mikey Scott's RBI groundout but Staples couldn't get closer. Norwalk reclaimed the momentum in the bottom of the sixth. Parlanti (2-3) with two runs off junior rightie Matt Reynolds, who pitched 2/3 of an inning. Senior rightie Dylan Meisner relieved Reynolds and struck out the one batter he faced. "I don't think any loss is a good loss," Lipper said. "Jacoby's a good pitcher and threw hard. We need to get hits in the first inning and we didn't do it today. Norwalk is a good team. They had kids come back from injuries and did well today." McFarland said, "Norwalk made more plays than us today." Staples hopes to return to its winning ways today when it hosts New Canaan at 4:30 p.m.
"We have a good lineup and have been behind before and there's no question we can come back every time," Lipper said. "We're still cocky and you have to be cocky in baseball. Every team loses and it gives us more motivation the next time around."